If you’re thinking of getting a guard dog, there are several things you need to consider before you hop online to look for a local breeder. From personality to size, and training to laws, here are some of the major factors to keep in mind as you go about figuring out whether or not to get a guard dog. Should you get a guard dog? The most obvious benefit of a guard dog is its ability to protect your family and your home. Physical protection aside, dogs have proven to be one of the best deterrents for burglars, with canines winning out over things like foot-traffic, close neighbors, and even that age-old home safety hack, the security sign. On the other hand, a negative aspect of getting a guard dog for your home is the fact that they could become overly protective and may attack someone who isn’t a threat. 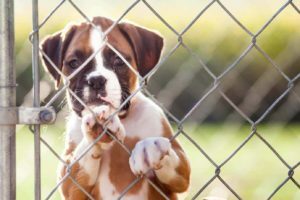 With a dog bite being a distinct possibility, it’s important to understand your own state and local laws regarding the issues before purchasing a guard pet. 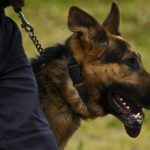 In most states, if a guard dog bites a burglar, the owner rarely faces legal repercussions. The law is less clear about consequences if the dog behaves violently toward an innocent victim even if the dog has shown no prior evidence of aggressiveness. From harmless strangers to postal workers, having a dog that could bite non-threats a dog biting those who aren’t legitimate threats is a serious concern that should be considered beforehand. 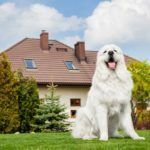 Now that we’ve gone over the pros and cons of getting a guard dog, let’s break down some tips and tricks that you’ll want to keep in mind if you go about getting and training a dog for your home. If you’re getting a guard dog, it’s imperative that you consider what kind of dog beforehand. Don’t just get the toughest, nastiest breed you can find. Be sure to choose a dog that is easily trainable and family friendly as well. If you’re merely looking for a burglar deterrent, size doesn’t have to be a huge factor here, either. Barking is as effective with small dogs as with larger ones. As with all dog training, starting them off at a young age is the best way to ensure that the training will have maximum effectiveness. Training a canine is important regardless of their duties around your home. However, if you want your pup to play the role of a guard dog, you’re going to want to make sure you have time to train them thoroughly, and we’re not just talking about how to use the bathroom. Here is a link to a thorough breakdown of how to train a guard dog. A critical element with a good guard dog is training them to bark out a warning any time a stranger comes to the door. 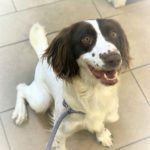 There are ways to train a dog to exercise educated barking, which involves both teaching the dog to bark at strangers as well as — critically — teaching them to stop barking on command. If you’re looking for a guard dog that will attack on command, make sure you’re serious. A true attack dog cannot make friends with anyone but their primary handler. If you do decide that this is the level of protection you’re looking for, you’re going to want to take care to teach them specific commands beyond simply how to defend your home and family. For example, make sure that they clearly understand basic obedience training and that they reliably know the command to back off and stop any aggressive behavior. Also, make sure to teach your dog to obey you over anyone else. If a burglar can control the dog using the same commands, your entire system will be compromised. It’s essential to ensure that you socialize your guard dog so that they know that every person they pass by in public, like on a walk through the park, isn’t a threat. Of course, the top of the list of people you want your dog comfortable with is your family, all of whom should spend plenty of time loving on the animal. It’s also helpful to teach them to be indifferent to other animals so that they don’t perceive cats, squirrels, or other dogs in the same light as a genuine intruder. If you have a dog specifically to guard your home and protect your family, don’t make it a surprise attack scenario. Let the world know! That doesn’t mean you have to drape “guard dog” warning signs on your property — though that certainly doesn’t hurt. 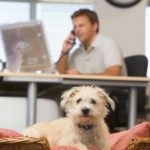 Little clues, like leaving a bowl and dish, leash, or dog toys out in plain sight, can send a message that you have a dog watching over your property. If you’ve trained a dog to guard your home, it’s essential that you don’t leave them alone with visitors. Even if they know someone is okay to have around, they may read a motion or specific behavior as a threat and could go into guard dog mode without you around to stop them. As an example, here’s a story of a guard dog attacking someone during a family get together. Be warned, though, the content is a bit graphic! 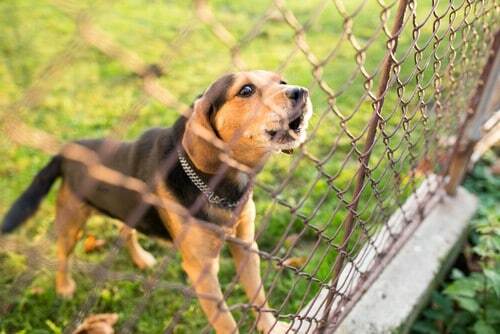 In addition to guard-dog training, use crate training to control your dog. That way if you have people over, you can send your dog to a safe place where they can relax away from the stress of company, and you won’t have to keep a vigilant eye on them the whole time. Remember, a guard dog isn’t invincible. If you’re going to invest in a pup to protect your home, it’s also important to back them up with things like a good security system and sturdy doors and windows. If you’re thinking of using your dog as protection over your RV, too, here are some extra tips for locking down your camper as you travel, as well. Some dangerous situations can occur when traveling or camping. A guard dog can alert you to potential dangers like wild animals and other unwelcome intruders. Whatever path you decide to take with a guard dog, whether you’re looking for physical protection or more of a family-friendly option with a good set of lungs, make sure you go into the decision with your eyes wide open. From choosing a breed to training, obedience, and socialization, a fully informed owner is the number one key to finding success with a guard dog.